Oasia Hotel Downtown SingaporeThe Oasia Hotel Downtown in Tanjong Pagar, Singapore. 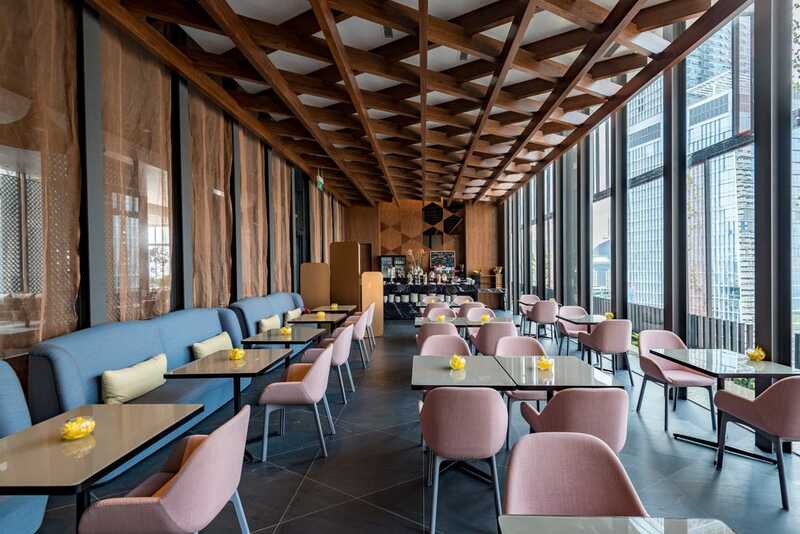 The Oasia Hotel Downtown was just announced as a winner of Urban Land Institute’s 2017-2018 Global Awards for Excellence. The tower won for its distinctive red facade, partially covered with plants. The ULI awarded eight projects in the United States, two in Canada, one in Europe, and two in Asia. On Tuesday, the research nonprofit Urban Land Institute (ULI) announced the 13 winners of the 2017-2018 Global Awards for Excellence. The competition seeks real estate projects that demonstrate “an innovative, forward-looking approach to design and development” and improve the sustainability and livability of their communities. 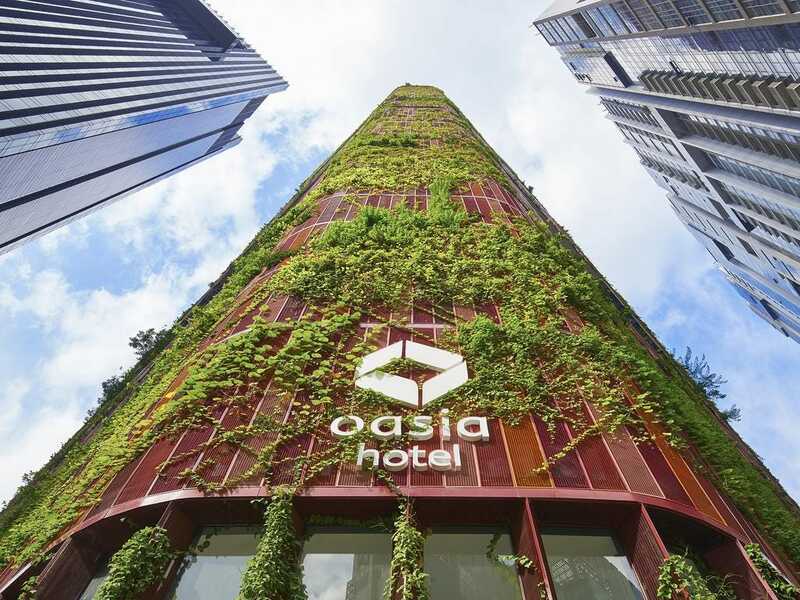 One of the winners is the Oasia Hotel Downtown, a project designed by local architects from WOHA in Singapore. It is located in Tanjong Pagar, the city’s central business district. The hotel won for its stunning red facade that is filled with greenery. The tower stands out among Singapore’s concrete, steel, and glass buildings. Oasia Hotel Downtown SingaporeThe restaurant inside the Oasia Hotel Downtown in Tanjong Pagar, Singapore. 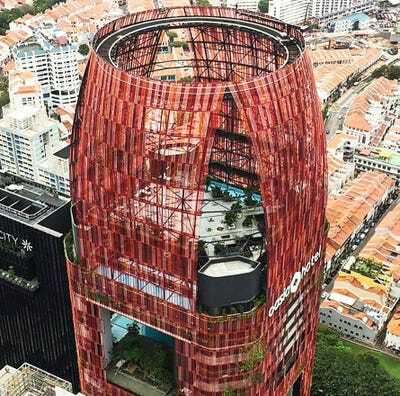 The 27-story skyscraper features 314 hotel rooms, 100 offices, a restaurant, a swimming pool, meeting rooms, a gym, and a garden that’s 98 feet above ground level. Completed in 2016, the Oasia Hotel was also the first of its kind in Singapore to have an underpass that directly leads to a subway station. Far East Organisation served as the developer of the tower. The photo below shows the construction of the facade, comprised of hundreds of red panels. Oasia Hotel Downtown SingaporeConstruction of the Oasia Hotel Downtown in Tanjong Pagar, Singapore. Overall, the ULI awarded eight projects in the United States, two in Canada, one in Europe, and two in Asia. Other winners include the Half Moon Village, a retirement community in California; the Buffalo Bayou Park in Houston, Texas; and The New School’s University Center in New York City.